Taken from their Top 40 album "Born To Break" the accompanying lyric video encompasses shots of the band doing what they do best, playing live in front of an audience, with the pictures representing their continued European onslaught. All pictures courtesy of Geordy Van Velzen/Photography Fidelis and Marty Moffatt. it as an anthem to help celebrate how they live their own lives." With the release of "Born To Break," THE AMORETTES have continued to demonstrate a considerable growth in both musicianship and song writing with Montgomery penning some of her most diverse material to date. "This is definitely a departure from our heavier catalogue," Montgomery said. 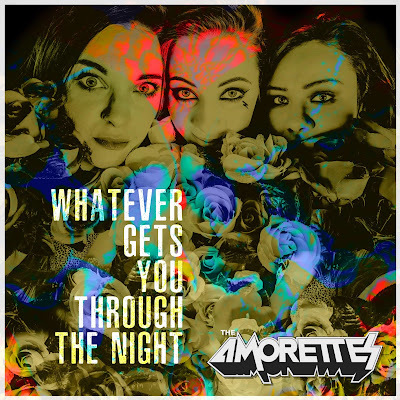 "However, I still feel that it encompasses the full Amorettes vibe." As with the majority of Montgomery's songs, it comes with a simple message for those who feel they may not fit in with the majority, "Haters are gonna hate! So, just get over it, and let your own little freaky flag fly." The album "Born To Break" was produced by Luke Morley of UK Arena Rockers THUNDER and recorded and mixed by Nick Brine (The Darkness, Bruce Springsteen etc..) and was released in April through SPV/Steamhammer as CD digipak, 2LP gatefold coloured version, download and stream.